Great cross over plant that will work as a STEPABLE Creeping Perennial and a fabulous All-Terrain Ground Cover. This Bellflower is a super cool alpine plant that forms delightful spreading cushions of deep green leaves, that are topped with violet-blue bells beginning in late spring and early summer. One of the most perfect plants for borders, rock gardens, or spilling over rock walls. Put this Campanula in a chink in the wall, angle it on the edge of a container to spill over or around flower bulbs for early spring bloom. 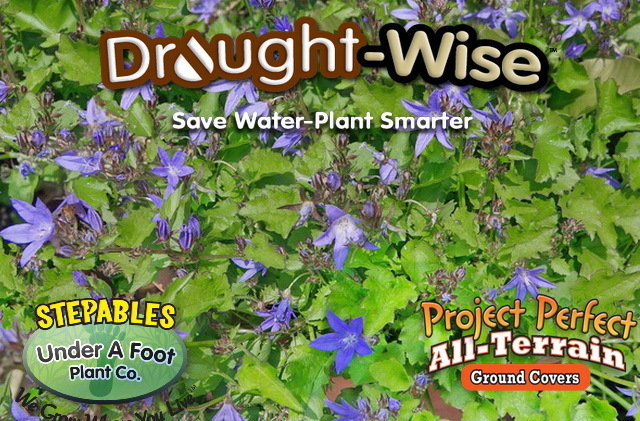 This Bellflower is a wonderful addition to any yard! One of the best for cascading over walls and containers and is a very Drought-Wise ground cover to use when watering is an issue. It is also very impactful when used in a meadow plantings. This Campanula can be used as an ornamental lawn alternative, with a light amount of foot traffic. However, if you are searching for a true lawn susbstitution, try looking at our STEPABLES that grow tighter to the ground for heavier foot traffic. Want More Landscaping Ideas? Check Out Our STEPABLES Containers, Curbside Plantings and Bark Replacement Garden Photos for More Great Landscaping Solutions!